It's the end of WW2 and highly strung Grace and her two photosensitive children are awaiting the return of her husband. 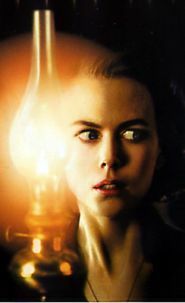 Grace lives an isolated and twilght existence but after the arrival of three uninvited servants she becomes convinced that the house is haunted by malevolent spirits. The Others is a stylish, spooky, highly intelligent ghost story that builds up the tension without having to resort to blood and guts.